Luke's Locker generously gave us about 75 pairs of gently used shoes, and because our work is relational, we wanted to creatively come up with a way to pass out these material goods in a way that allowed us to connect human-to-human. 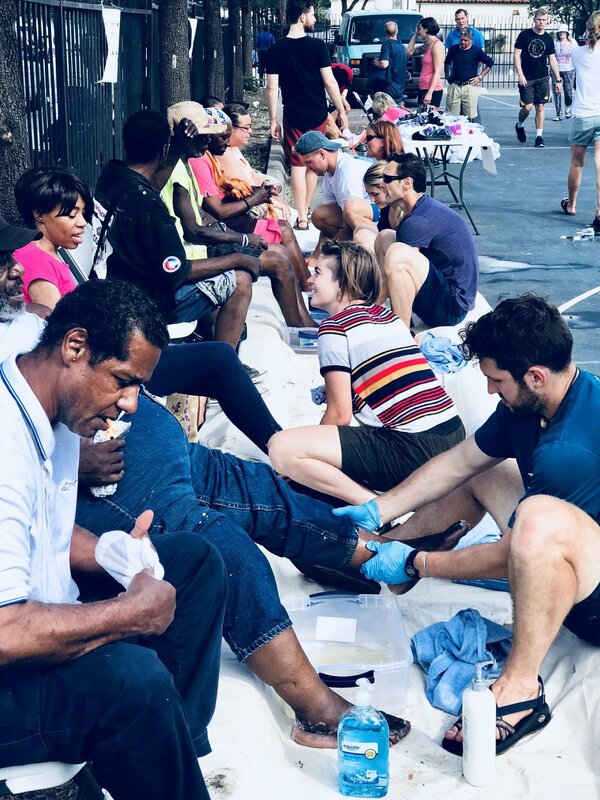 We set up several different stations where our homeless friends could come, have their feet washed, get a brand new pair of socks, have their feet accurately measured and sized, and then receive a new pair of shoes. Special thanks to Austin Street Center for graciously allowing us to set-up on their property. The heartbeat of the morning centered around the feet washing experience. This act allowed us to connect with our homeless friends in a physical, spiritual, and emotional way. The person washing the feet and the person receiving the feet washing had to be vulnerable and humble. There was give-and-take on each side, and we found ourselves honoring each person's dignity over a sudsy bucket of water that beautiful morning. So why feet washing, you may find yourself asking? That answer can be found in the moment right before our event began on Saturday morning. Our team, the Dallas Fellows, and our homeless friend Larry all circled up together to read the gospel of John 13. This passage tells how Jesus washed his disciples feet the night of the Passover, the night before his death. Jesus says in verse 14 "Now that I, your Lord and Teacher, have washed your feet, you also should wash one another's feet." Special thanks to Matt Lucas with Luke's Locker for coordinating the shoe donation.